Tostada is the Spanish word for toasted. It can refer to a slice of toasted bread, a fried plantain or a toasted flat bread; it all depends on which Spanish speaking country is using the word. In Mexico we are referring to a toasted corn tortilla when we use the word tostada. Typically Mexican tostadas (plural of tostada) are made by deep frying a corn tortilla until it is nice and crispy, but you can also pop them into the oven and bake until crispy. Once the excess oil is allowed to drain off then it can be topped with just about anything your heart desires. They can be as simple as a smearing of salsa or crema, a slathering of refried beans or a couple of slices of avocado, the possibilities are endless. Depending on what the tostada gets topped with, it can become anything from a snack, to an accompaniment to a full meal. The options are endless and that is why tostadas are a great item to keep stocked in the pantry. I previously mentioned how tostadas are made, but they can also be purchased at the grocery store. Since I live in Mexico I of course have a great selection of brands so I don’t make them at home any more. If you have extra corn tortillas that need to be used up then tostadas is a great option. Either fry them in a bit of oil or stick them in the oven — I always choose the oven method for a healthier option. If you would like to purchase them check out these options or look for them in the hispanic food isle in your grocery store. The tostadas you see before you were a complete meal for hubby and I. They are filling enough for our main meal of the day, yet light enough that they didn’t leave us with that oppressive heavy meal feeling. The shrimps were cooked with a little secret ingredient called verdolagas in Spanish and purslane in English. This green plant is considered a weed in the US but eaten in many regions of the world. It has a tangy taste that reminds me a bit of lemon, which is why I though to pair it with the shrimp — it worked fantastic. The salsa I can describe to you as spicy, smokey, salty and right down delicious. My plan was to also cook the serrano peppers, you see in the pictures, with the shrimps but when I tasted the chipotle salsa I knew they wouldn’t be needed. A healthy shrimp tostada recipe that is topped with a spicy and smokey chipotle pepper salsa. Heat a griddle or large frying pan. Once hot place the tomatoes, onion and garlic onto it. Allow all three to char on all sides until they become soft. The garlic and onion will likely be ready before the tomatoes, keep an eye on them so as not to burn. Once charred set aside to cool until you can handle them. Peel off the charred bits and skin from the tomato, scrape the charred sections of the onion and garlic. Then place them along with all other ingredients into a blender, add the cilantro last or on top of other ingredients. Blend until smooth, then set aside until ready to use. If you are using large shrimp, cut them into smaller pieces to make eating easier. Heat the oil and once warm sauté the garlic over low heat. Next add the shrimp, salt and verdolaga leaves and cook until shrimp are firm and pink. This should only take a few minutes. Serve on top of tostadas and dress with freshly chopped cilantro and chipotle salsa. ** Salsa Notes: The tomatoes are added to try to cool the spiciness a bit, but be warned that the salsa is still very spicy. The tomato, onion and garlic are charred to cook them and give a bit more depth to the salsa. Skipping this step isn’t a good idea because salsa might separate and will miss some of the flavours. Mark and Harleigh’s family are raising funds to help pay for her medical bills. There are many ways we can help. The family has created a Give Forward page to collect donations. Remember any donation will greatly help the family. Then there’s also the #Help4Harleigh Online Bake Sale which starts February 18,2014 and you can either donate baked goods, new cookware, new cookbooks and/or bid on items. Another great way to help is to spread the word to anyone you know — online and in real life too. 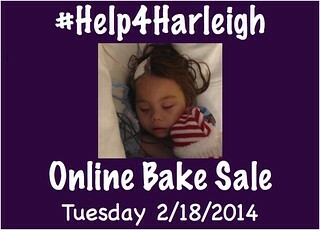 For full details on Harleigh’s story and how to help, please visit Mark’s blog. Bobby and I eat A LOT of tostadas and top them with lots of different ingredients. However, we’ve never made shrimp tostadas. These look like a perfect meal for us. Love all of the flavors especially that chipotle salsa! Thanks for sharing this Nancy! So you both know how great tostadas can be. Thank you MJ and I hope you give shrimp tostadas a try soon. … I was so touch by the story about Harleigh, such a horrible thing for a little girl to go through, I can’t imagine how the parents must be feeling. Halreigh’s story is so sad. I’m sure we all wish her and the family nothing but the best. Thank you Julie! Scrumptiously exotic and summery! A wonderful dish. These tostadas look amazing! In college, these were my staple, because along with spaghetti, they were about the only thing I could make. This will be a nice “grown-up” version. Thank you for sharing– I can’t wait to try them! Wonderful and beautiful! I could eat this every day! G’day and what a delicious recipe Nancy, true! Your photos are always so mouth-watering and inspiring too! Mouthwatering tostadas, and I love the chipotle salsa! I was very impressed by Harleigh’s story. Such a difficult time for her and her parents, thank you for spreading the word how to help! Love these spicy, crunchy tostadas! A beautiful dish Nancy, love the flavor of chipotle and tostadas. Thanks for sharing a touching story, I pray from the bottom of my heart for the beautiful child. God give strength to the parents to deal with it. It’s so tough. I hope all this positive energy really reaches her and her family. Oh my… heartbreaking story about little Harliegh. I will keep this sweet little girl in my prayers and check out their online bake sale. Mark, it is my pleasure and I truly hope you raise lots of money for Harleigh. All my best to your family. These tostadas look absolutely amazing ! I’m wondering about the cinnamon you are using , is it Ceylon or Cassia ? Thank you and have a great ! Thank you! I used canela or what we in Mexico call cinnamon and it is Ceylon. Enjoy the sauce and tostadas.